Those of you who have been following me for a long time, know that I have always been ALL ABOUT PINOT. It was Laura Ness and some of the other longtime Shootout judges that suggested more than once that we do a Rhone Shootout. I finally agreed. We put out the word and the wines came in daily with deliveries from GSO, UPS, Fedex, and DHL. 267 wines from a myriad of producers. The wines were catalogued and sorted. In this, the 1st year of the Rhone Shootout, the Affairs of the Vine professional judging panel tasted 267 Rhone wines, most from California and Oregon but some from Washington, Michigan and Australia. We found outstanding examples of New World Rhone wines from wineries that we know and we’re delighted by many of the wines submitted from producers new to us. The overall quality of the wines was incredible. In fact, we awarded more gold medals on a percentage basis than we have ever awarded in any previous Shootout. The Rhone Shootout was a comprehensive and focused tasting of New World Rhones. The judging panel, an incredibly diverse panel of 52 wine professionals, tasted 267 wines over a three-month period. Just 32 wines were tasted by the experts per day, allowing the judges to be completely immersed, focused and fair to the wines. Palate fatigue is not a factor in our tastings. The wines are tasted completely blind without reference to appellation, vintage or price. Each wine submitted to the Rhone Shootout was tasted a minimum of twice. The top rated wines were then tasted by our panel of experts at the Rhone Shootout Finals on June 23, 2012. Again, each judge was responsible for tasting, scoring, and analyzing only 32 wines. The Rhone Shootout judges’ decisions were then put to the test during the Rhone Shootout Challenge at Romancing the Rhones on July 14, 2012 in San Francisco. 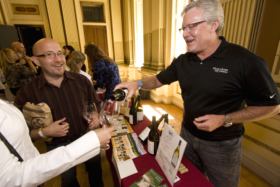 A large unbiased group of wine lovers tasted, analyzed and voted for their favorites at The Rhone Challenge of 41 of the top wines at Romancing the Rhones on July 14, 2012 in San Francisco. In a distinctly different format and atmosphere from other wine-tasting events, the attendees blind tasted the wines and pitted their palates against the expert judging panel. The wines were divided into 2 groups of wines. (The Blue Group and The Green Group). The wines were wrapped individually and identified by a random color. The male and female votes were tallied separately. William Allen announced the winners of the Rhone Shootout Challenge at Romancing the Rhones on July 14th. The Rhone lovers spoke out loud and clear at Romancing the Rhones. In an unusual and rare instance men and women agreed,. They both selected, by an overwhelming margin, the Derby Wine Estates 2007 FIFTEEN 10 Red blend ($28) from Paso Robles as their number one choice. The women also selected winemaker Katy Lovell’s Poetic Cellars 2009 Muse Vineyards Mourvedre ($29), from her Livermore estate vineyard, as their # 2 favorite. Attendees were also asked to cast their chips for their favorite white, red and rose tasted at the winery tables. The Wine Lovers agreed with the judging panel…the wines tasted were fantastic!